I grew up in Limboto, Gorontalo. I felt my first earthquake, saw my first lunar eclipse, and tasted my first hot spring water in Limboto. I raised by two different poles, a military father and a tender mother. I’m a graduate of the Hasanuddin University with a degree in Geophysics and have a Masters in Geology Engineering. My undergraduate thesis is about seismicity and my master thesis is about geothermal. I’m working as a lecturer and I'm the Head of Geology Laboratory at Gorontalo State University. Besides Geology and Geophysics practice, I'm creating programs in my lab called Student Progressive Programs. I attended a Young Lecturer Apprenticeship Program at Gadjah Mada University about university management. This program is implemented by Directorate General of Higher Education. I attended an Apprenticeship Program in LIPI Karangsambung about geology field as a MoU of Gorontalo State University and Bandung Insitute of Technology. I have completed the Geothermal Geochemistry Training and Training of Trainers for Geothermal Resource Assessment in Sedimentary Basins for Low/Medium Entalpy Resource. The training was conducted by the Ministry of Energy and Mineral Resource, Geothermal Capacity Building Program (GEOCAP) Indonesia - Netherlands, The Netherlands Organization (TNO) for applied scientific research, Utrecht University, Gadjah Mada University and Bandung Institute of Technology. I received a certificate of commendation from the Director of Asia Africa Center of Ehime University, Professor of Research Center for Sustainability and Environment of Shiga University and Associate Professor of School of Humanities and Social Science of Nagasaki University. The certificate was given to me because I have successfully completed a mission in Indonesia for the co-creation of regional innovation. My favourite place on Earth is a volcano. 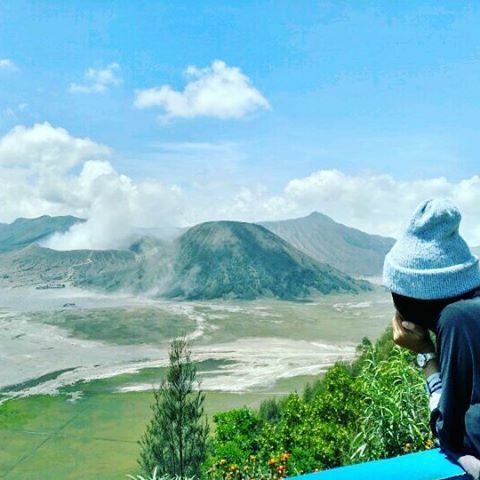 I went to Dieng Volcano, Merapi Volcano, Bromo Volcano, Colo Volcano and Tangkuban Perahu Volcano. I’m a professional member of the Indonesian Association of Geophysicist. I’m interesting to Volcanology, Geothermal, Geophysics, and Hazard Mitigation. Earth science is my passion. I like earth science more than I like fresh coconut iced drink. Sport: I’m the Cules, but I always pass Barca match. Art: I tried to leaved music and play guitar several years ago, I am a traditional dance lover, painting lover and poetry lover. Movie: Western, Sci-Fi, History, Fantasy and Adventure. Find me on my other page: Web, Orcid, Google Scholar, Research Gate, Sinta, Facebook, Twitter, Instagram, Youtube, Google Plus.